I have worshiped and cherished you. You are the island, we are grains of sand. no one ever to tell our story. You offer me what all men dream about. the hero’s welcome the lover’s kiss. and month by month the same. You show us only what you’d have us see. we are visible only by your light. as skilled at sacred arts of love? as much to offer me as you? but no, on all counts. glimpsing the depths of our unworthiness. it has not to do with competition. my choice is simply which of you is mine. I once told someone that my name was No-man. not less than one, nor more than man. with things begun in earnest. It’s with Penelope that I shall find it. a fragile, mortal, human thing. for what little may be left. Mistress, goddess, I am at your mercy. Snuff out the guttering candle that I am. to some eternal torment like Prometheus. Jack McCarthy of Lake Stevens calls himself a “standup poetry guy.” Others have called him a “legend.” Poet Stephen Dobyns calls him, “one of the wonders of contemporary poetry.” The Boston Globe said, “In the poetry world, he’s a rock star.” He’s an engaging minor character in the film “Slamnation,” He has been heard on NPR, won poetry slams from Seattle to San Antonio to Portland, Maine, and been featured as far away as Germany and Spain. High school students nationally perform his work competitively. hanging in Janet and Chrissy’s apartment. knocking over their lava lamp, their 8-track player. he became tangled in the milfoil at Echo Lake. macramé summer for that family. flattened, its white spine stretching past its tail. its veins wrapped tightly together. on the kitchen table while she ran out to buy more beads. Kelli Russell Agodon’s poem “In the 70’s, I Confused Macramé and Macabre” was previously published in Letters from the Emily Dickinson Room (White Pine Press, 2010), winner of the ForeWord Magazine Book of the Year Prize in Poetry and a finalist for the Washington State Book Award. Her other poetry collections are Small Knots (2004), and the chapbook, Geography (Floating Bridge Press, 2003). Kelli is also the co-editor of Fire On Her Tongue: An eBook Anthology of Contemporary Women’s Poetry. millennia of snow, bones of otters, mammoths, nets, bird arrows and feathers of birds. Ice-bound boulders larger than the grand hotels. Whole trade routes washed away. Skilled women gone, children dead. A few eyes left to carry the smattered genes of the Chinook – lost tribe, old photos, hand-written books. Tidal seeps, rain and slick water standing in the side channels. Eye sockets stacked in heaps, the white island – Memaloose, the piles of skeletons, the eyes of birds, the fish, the salmon, the grandmothers, the restless ghosts of men – they carry stones called strength from place to place. a handful of painted rocks – The Spedis Owl, wild goats with back-curved horns, the counting marks, and She-Who-Watches the now-ponded river atHorsethiefPark. Petrogyphs lying drowned behind the dam that drownedthe Dalles, the spider-work of fish scaffolds. Stones that weighed the old nets down. Spear points. Bones. Our short, uneasy sleep. fresh and smoked salmon, spawners, smolts, whitefish eggs, furs, hides, blankets, travelers, language, tuberculosis, knives, wives, dentialia shells, dollars, smallpox, words, horses, dogs, feathers from Mexico, September Monarchs swinging to the south, water, grey sand worn from the stone plateau, storms, months of rain, iron, seals, smelt, paddles with pointed blades, brown flood water, whitecaps, huge waves smashing at the bar, medals. The rum and oarlocks of English sailors. Coppers from the Haida. Beaver hats, smelly uniforms, potions, poisons, spells and powers. Sturgeons – 20 feet long, 200 years old, a ton heavy – condors, buzzards, terns, and gulls. Bill Yake has worked lookouts, monitored Olympic mountain butterflies, run a sub-three hour marathon, and authored the Washington State Dioxin Source Assessment. His poems are published in several chapbooks and two full collections from Radiolarian Press (Astoria OR): This Old Riddle: Cormorants and Rain (2004) and Unfurl, Kite and Veer (2010), as well as in numerous magazines serving the literary and environmental communities. Bill lives near Olympia, on a small ravine tributary to the Salish Sea. Jourdan Keith is a VONA, Hedgebrook and Jack Straw alum. Voted 2007 Seattle’s Poet Populist, her awards include Seattle’s Office of Arts and Cultural Affairs, 2004 for the writing and solo performance of the play “The Uterine Files” and 2010 for her memoir Coyote Autumn which is included in the anthology Something to Declare. A student of Sonia Sanchez, she is a playwright, storyteller and Seattle Public Library’s first Naturalist-in-Residence. I was playing again on the stone stairs. I could hear the hiss of seconds passing. to the dolls, my prisoners. ever is. I turned on a top stair. my own. I step over the threshold . . .
a hissing sweep of my gown. could exist in one blossom? and mayonnaise, cuticle and tusk. of color, but its fullness. cigarette smoke, bone china, milk. Peter Pereira is a physician, a poet, and the founder of Floating Bridge Press. His poetry collections include Saying the World (winner of the Hayden Carruth Prize and a finalist for a Lambda Literary Award) and What’s Written on the Body, both published by Copper Canyon Press. His work has been included in many anthologies, including Best American Poetry and To Come to Light: Perspectives on Chronic Illness in Modern Literature. “Magnolia Blossom” is an ekphrastic poem based on a photo of the same name by Imogen Cunningham. and cast a shadow by day. Patrick Forgette taught English as a foreign language in Japan and English as a high school subject in Seattle. His poems have appeared in Crab Creek Review, DIAGRAM, Floating Bridge Review, and Word Riot. 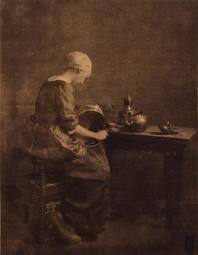 Myra used her housekeeper, Alma Schmidt, as a subject in several of her pictorial photographs of Dutch domestic life. Schmidt wore costumes and posed in a variety of theatrical scenes. No further record of their relationship exists. blessing identity until it blinds us. a woman’s hands: fingernails, blue. Susan Rich is the author of three collections of poetry, The Alchemist’s Kitchen (2010) named a finalist for the Foreword Prize and the Washington State Book Award, Cures Include Travel (2006), and The Cartographer’s Tongue / Poems of the World (2000) winner of the PEN USA Award for Poetry. She has received awards The Times Literary Supplement of London, Peace Corps Writers and the Fulbright Foundation. Recent poems appear in the Harvard Review, New England Review, and The Women’s Review of Books.